In order to pay online you must log-in with your email and password. From Your Bullseye Sailing Association Membership Information page click the Annual Meeting - Pay Fee button. Welcome to the Bullseye Sailing Association! To promote use of the fiberglass Bullseye as a family boat, and for recreational sailing. 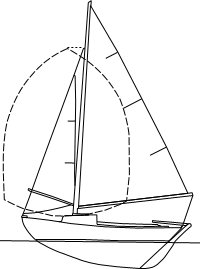 To provide specifications and rules in regard to hull, spars and sails in order to protect one-design aspects of the fiberglass Bullseye, and to insure uniformity and safety in racing. To establish communication between individual owners, and groups of owners, of fiberglass Bullseyes, by means of newsletters and an Association Bullseye publication. To encourage participation by owners of fiberglass Bullseyes in racing. The following pages describe the Cape Cod Shipbuilding Bullseye one-design sailboat, its Herreshoff design heritage, and the group of owners known as the Bullseye Sailing Association. Also included are the complete Constitution, the Technical Specifications A-D, the Technical Specifications E Sails and Regattas Rules of the Bullseye Sailing Association, the results of past National Regattas, some helpful hints for the care and feeding of Bullseyes, listings of sailmakers, trailer manufacturers, a photo gallery of Bullseyes under sail and more. Fleets located all along the East Coast keep in touch through the Bullseye Newsletter, which is packed with sailing tips, stories, regatta information, and results. We have members all over the country, but the chartered fleets race out of Key Largo FL, Fishers Island NY, Saunderstown RI, Marion and Rockport MA, and Southwest Harbor ME. Everyone comes together for the Bullseye National Regatta. The location of the regatta rotates, which allows for a change of scenery. Come join the fun, and , if you have an active fleet, consider becoming a chartered fleet. The Constitution and Rules have been changed so that "Bullseye Sailing Association" replaces every occurrence of "Bullseye Class Association", and "BSA" replaces every occurrence of "BCA". Dues are payable to the Bullseye Association, and are due January 1 each year. Membership information is available on the Members page for dues current members only (requires a log in). Your information can be edited on-line or you may complete the Membership Form or Club Membership Form. You have the option of paying your dues by check, sent to the Treasurer, or by using your credit card or PayPal account through PayPal by logging in as a member on our website Members page. Pay dues from your membership information page. New members may create an account at the New Membership page. New members are accepted by an officer and are listed after dues are paid. $50 Family membership for two persons over the age of 18, living in the same household (two votes) There is no requirement that families purchase a family membership. In cases where two people are both very active in the Association and both want to vote, it is an option and a great way to better support the Class. Photo from Lands Edge Photography on Sunday. Congratulations to Chris Collings in Puff (766) for winning both the Singlehanded and the National Championship. Thank you to the volunteers at Buzzards Bay Regatta and Beverly Yacht Club for a great event. 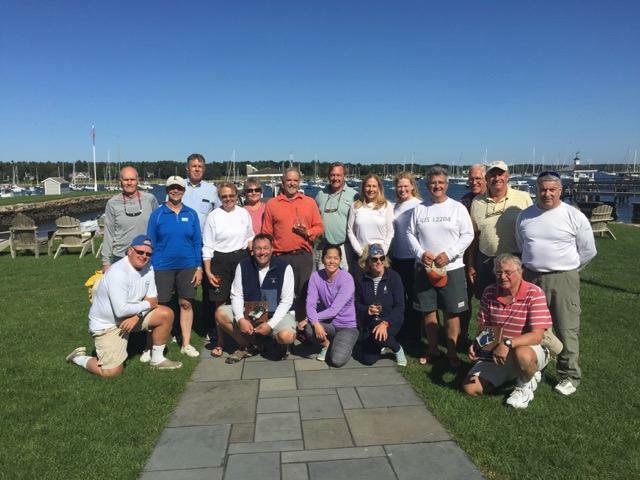 The 2nd annual Single Handed Challenge (SHC) was held at the BYC on Saturday, September 9. With twenty-two boats participating in ideal fall conditions, everyone had a great time. This year, the SHC attracted many new faces with one H12 skipper coming from Buzzards Bay and five BYC members trying their hands in Bullseyes and H12s for the first time. The fun started Friday night with an informal mixer at pub night. Racing action began at 10am on Saturday. Twelve H12s and ten Bullseyes sailed on short windward-leeward courses and completed five races in each class. The race course was set up between club marks C & Y, allowing a fleet of BYC spectator boats to get a great view of the racing action. Race results where announced on the club deck immediately after racing, and the regatta was wrapped up with a pot luck dinner party at Harriet's Outback on Cottage Street. The 2017 Bullseye National Championship hosted by the Winter Harbor Yacht Club was held July 20-23, 2017 in Winter Harbor, Maine. Congratulations to Jed Hoffer and Kim Lee in Ferdinand for winning the 2017 National Regatta and Chris Collings for winning the single-handed event. The 55th Annual Bullseye National Championship was held on April 7 - 10, 2016 at the Card Sound Sailing Club in Key Largo, FL. The Nationals was held on July 31-August 2, 2015 at Sandy Bay Yacht Club in Rockport, MA. Congratulation to Kym Lee and Jed Hoffer for winning the regatta (E.L Goodwin Bullseye National Trophy) and for the Rockport Trophy (to the highest finishing boat not a member of the host fleet). The Beverly Trophy (skipper who shows the most improvement from previous Nationals) was awarded to co-skippers Conrad Lavigne and Suzanne Gosselin. The Filial Trophy (to the highest finishing boat with at least two generations of the same immediate family) went to	Nicholas Kotsatos, Heather Parsons and Carolyn Marsh. The Nationals Chair was Laura Hallowell, secretary@bullseyeclass.org. The 2014 Bullseye Nationals, hosted by the Fishers Island Yacht Club, was won by a Fishers Island team, past champion Peter Rugg sailing with Carter Rose. The pair won two of the seven races in the series, finished second in four other races, and their worst finish was a third, out of 17 boats competing. Second place by only one point and scoring three first-place finishes was Kym Lee/Jed Hoffer, of the Beverly Yacht Club, in Marion, Massachusetts. The 2013 Bullseye Class 52nd Annual National Championship was held at the Saunderstown Yacht Club near the birth place of the 12-1/2 hull shape, Bristol, on the Lower West Passage of Narragansett Bay on September 6-8, 2013. Congratulations to Richard Feeny in Smoke for winning the regatta. For complete scores see results. The Notice of Race, Sailing Instructions and any other information and registration are available. The Bullseye 2012 51st Consecutive National Championship was held in Marion, MA on August 11-12, 2012. See complete scores. The Bullseye 2011 National Regatta was held in for Bristol, RI on August 19-21, 2011. Congratulations to Chris and Kathryn Collings in Puff #766 from Beverly YC for winning the event! See complete scores. The Bullseye 2010 National Regatta was in Key Largo, FL (Card Sound Sailing Club) on March 18-20, 2010. Congratulations to Sally and Bill Martin in #778 for winning the regatta! See complete scores. The Bullseye 2009 National Regatta was in Rockport, MA (Sandy Bay Yacht Club) on August 1-2, 2009. Please see Final Results. Congratulations to Chris and Kathryn Collings in Puff #766 for winning the regatta (second year in a row)! See complete scores. The Bullseye 2008 National Regatta was at Fishers Island Y.C. on July 25-27, 2008. Congratulations to Chris and Kathryn Collings in Puff #766 for winning the regatta! See complete scores. See great photographs at Chipriegel Photography, the official photographer for the event, and at Sailing World. The Bullseye Sailing Association is not operated or controlled by Cape Cod Shipbuilding. As a member of the Association, Cape Cod Shipbuilding has an equal vote in the future success of the Bullseye Sailing Association. The Bullseye Sailing Association is grateful for the support that Cape Cod Shipbuilding has always provided to the Association.